I added a new discoverable entity C++ class that is inherited by the resource/portal entity. I inherit this same discoverable entity class in my new fortification entity so that I can share the common functionality. Right now the fortifications look like the existing towers since I am reusing the assets. They also fire projectiles in the same manner. One main difference is that these fortifications are grouped together with their “parent” resource/portal. Changes in their state are sent to the resource, such as when they are destroyed. When all 4 fortifications have been destroyed, the portal can then be attacked. I captured a simple screenshot to give a basic idea of the fortress. I want to emphasize again that the art assets and look of the fortress will change dramatically during the next milestone when I focus on visual enhancements. Each fortress will have many components that are themed for each leader class. For instance, the mage class could have floating islands chained together to form a fortification. I want interesting and dynamic fortresses. 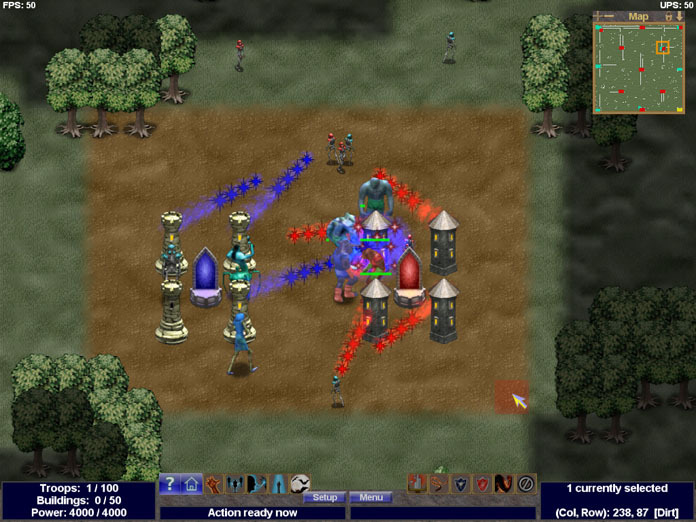 The screenshot below is showing a scenario where two fortresses are near each other. They are firing upon zealots, troops, and other fortifications. Eventually, the fortresses will be built upon rocky terrain that defines the foundation, where the center will be a crystal formation that represents the main resource where the portal resides. Players will use their leader to summon a portal over the resource, which will initially have very basic protection. Each corner fortification can be upgraded with its own progression path. When all 4 fortifications have their first tier of upgrades, the portal can be upgraded to a keep with its own bonuses. Then another round of upgrades can be done to the fortifications, where the upgrades will be more important. Likewise, when all 4 have their major tier of upgrades, the keep can be upgraded to a stronghold. At this point, players can choose to summon a guardian for the fortress. I want to treat fortresses like an RPG player class where only a subset of the full ability list can be obtained — at least efficiently. As skills and abilities are researched, they are burned into the portal and remain until the portal is destroyed. Therefore, players can choose to switch to different upgrade paths in order to learn new abilities, but at a greater cost. The same thing can be done if a fortification is destroyed. However, the passive bonuses associated with upgrades will be lost, which makes it even less desirable. For example, a meaningful troop bonus might be lost when switching the upgrade path to a new one. The efficient way to gain all skills and abilities for a fortress is to share technology between fortresses. This is accomplished by sending zealots from one fortress to another. Not only does this gain the prestige resource for the source fortress, but it also shares technology with the destination fortress. Players will have a selection of all upgrades not owned by the destination fortess. These upgrades can be queued up and they cost power as the resource. The progress will be “pulsed” as each new zealot spawns from the source portal. As long as there aren’t any gaps (killed zealots) between the fortresses, the technology will continue to be learned until completion. This tech sharing will further encourage players to protect their zealots as they head towards their destinations. If any zealots are killed, the tech sharing is broken until the “circuit” is continuous again. It also creates opportunities to harrass enemies with the goal of breaking the zealot lines so their tech progression is hindered. I think it will create some fun and interesting gameplay. Furthermore, the zealots will also share the “pulse” energy with leaders in range of the target zealots. This power will convert to rage, which is a required resource for the elite leader abilities. I imagine scenarios such as a leader devastating a fortress, until a group of troops ambush the zealots behind the leader and cut off the rage resource, which will also be depleted over time. You are currently browsing the Developer’s Journal blog archives for April, 2013.